We began the Famous Names of June with the Queen’s Diamond Jubilee and that’s how we shall end it, for last week was Royal Ascot in Britain. This famous race meeting is one of the high points of the British social calendar, and is attended by Queen Elizabeth and other members of the royal family, who arrive each day in a horse-drawn carriage. This year there was a record crowd of around 10 000 Aussies at Royal Ascot; so many descended on the racecourse that several bookies were taking bets in Australian dollars. They were there to see Australia’s favourite mare, Black Caviar – one of the racing world’s greatest sprinters, who has won a record number of races in her career. She had already won 21 consecutive races from 21 starts – could she make it 22? Could she win internationally? And could she win at Ascot? It turned out she could – by just a whisker. It was a nail-biting photo finish to the Diamond Jubilee Stakes on June 23 which left the Australian fans jubilating. 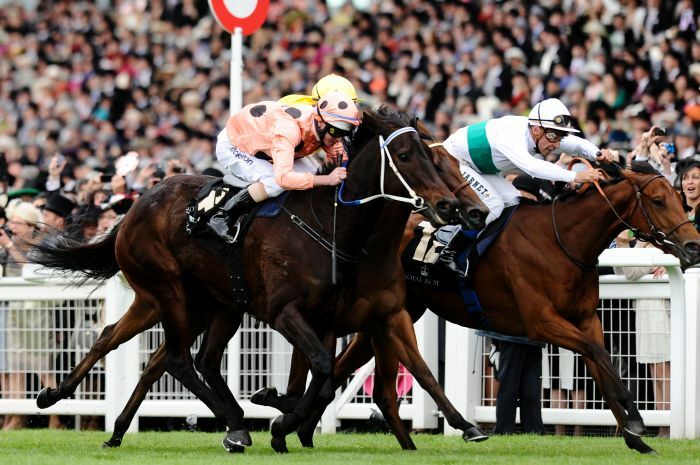 Black Caviar won her owners more than $6 million and she got to meet the Queen, who patted her nose. Unfortunately, the mare sustained injuries during the race, so it may be the last one of her career. Ascot is an upmarket village in Berkshire, its name from the Saxon for “eastern cottage”; probably referring to it being to the east of the royal estate of Easthamstead, where Edward III had a royal hunting lodge in Windsor Forest. For most its history, Ascot was a large and dangerous heathland, frequented by highwayman and other rogues. You seemed to be allowed to shoot them on sight, like other vermin. It was Queen Anne who discovered what a wonderful place this empty heath made for galloping around on one’s hunting horse. It was conveniently located just five miles from Windsor Castle, and presumably she had bodyguards to shoot the highwayman so they didn’t bother her as she bolted around the heath on her plunging steed. As it had proved such a superb place for horses to gallop, Queen Anne founded Ascot Racecourse in 1711; the first race was three heats of four miles long, so it was an endurance test more than anything else. Not only is the Racecourse a vital part of the village, but Queen’s Anne’s “Her Majesty’s Plate” became Royal Ascot Week. The Royal Enclosure at Ascot (an innovation of King George III) is a pinnacle of sartorial elegance with a very strict dress code. (Fun fact: 400 Australians are admitted to the Royal Enclosure each year on a ballot system). Not surprisingly, Ascot has given its name to at least two items of men’s fashion. The ascot tie, a type of cravat, dates from the early 19th century, although by the Edwardian era it was no longer correct dress for Ascot, and had become casual wear for playing sport in. If you are having trouble picturing an ascot, an orange one is worn by Freddie in the Scooby-Doo cartoons, as ascots had a revival during the psychedelic days of the 1960s and ’70s. The ascot cap is a hard flat cap that was popular in the early 20th century, and presumably was considered suitable for wearing to Ascot, although information on its history is pretty thin. There are several suburbs in Australia named Ascot after the one in Britain; the one in Perth even has its own racecourse. Although lacking in royal history, it’s over a century old and still an excellent racecourse; the finest in Western Australia. Ascot is occasionally used as a boy’s name, although apparently it’s listed on a website called Stupid Kid Names (kind of mean, and not written in very good English as you can probably tell from the title alone – I can’t link to it as it’s chock-full of foul language, but I’m sure you can find it if you want to). However, this website also censures such perfectly normal names as Aidan, Asher and Declan (I couldn’t be bothered reading past D in the index), so I wouldn’t pay any attention to that. I was happy to see that our own Bree from The Beauty of Names stuck up for several of these unfairly vilified names at Nameberry, and if you happen to find your own name on this site, don’t sweat it. Some people have psychological issues and a limited vocabulary, and although you may wish they would get counselling and buy a thesaurus before starting a website, they are at perfect liberty to do otherwise under our democratic system. Ascot is a place name with an interesting history, and connections to royalty, fashion and the sporting world. It may appeal to you if you are looking for an unusual name which is both modern and somewhat distinguished, and it sounds a bit similar to Astor and Aston. I think it would work well in the middle position, as it is a good match with so many different names. George Ascot, Dean Ascot, Mason Ascot, James Ascot, Barney Ascot, Monty Ascot, William Ascot … see what I mean? Well I did include it as it made another Australian link …. I guess if you had a connection to racing it might seem more usable?